Using a Travel Recruitment Agency | Looking for a new travel role? Understanding there’s a difference between corporate and leisure, Amadeus and Travelport, even inbound and outbound is the reason you should consider using a specialist travel recruitment agency when you’re filling a travel role or looking for a new one. Would you use a realtor in Bath to buy a home in Bristol? Ask a criminal lawyer to help you register it? Or an interior designer to re-design your new garden? There’s comfort in entrusting your ‘problem’ in the hands of someone who has first-hand experience and that’s why using a specialist travel recruitment agency instead of a general recruitment agency when you have a travel recruitment ‘problem’ makes the most sense. Ask any recruitment agency specialising in travel if their staff have first-hand experience in the industry for which they are recruiting. It’s important that the professional with whom you are dealing not only understands the nuances of the travel industry, but that he / she has also experienced it first-hand. The value that this personal experience of a travel role or roles brings to the recruitment process in time savings and quality of service is immeasurable. Recruitment agencies specialising in travel are well aware of the unique skills and requirements for different roles and what the going salaries are (although a recent BBC study wasn’t particularly complimentary about what travel agents earn). They are able to evaluate where the skills of a candidate are best matched and in which companies they would be the best fit. Think of the recruitment process as a ladder. By working with a specialist travel recruitment agency, you’re already several rungs higher than you would have been if you were working with a general recruitment agency. Specialist travel recruitment agencies and their staff have spent years developing relationships within the travel sector. They are usually well known and have large travel networks. As a candidate, you can be assured that they have a range of travel roles available within sought-after travel brands. As an employer, you’ll have access to an extensive network of passive candidates. Progressive’s Lee van Staden has these tried and tested tips for getting the best out of your travel recruitment agent. 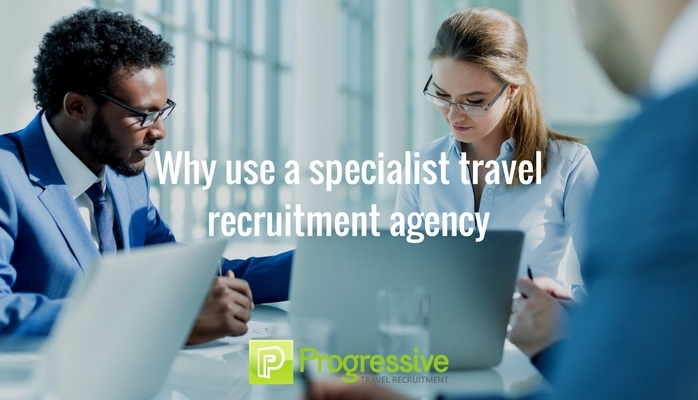 If you’ve ever spent hours wading through hundreds of CVs or job ads, you’ll understand the value of using a specialist travel recruitment agency. As an employer, you can eliminate time wastage when presented with a shortlist of quality candidates. As a candidate, you have access to job opportunities that are not necessarily available elsewhere. The risk of the wrong candidate in the wrong job is vastly reduced by using a recruitment agency that specialises in travel. Get travel recruitment smart with Progressive Travel Recruitment and follow us on Facebook, LinkedIn, Twitter or our weekly blog for new travel roles and travel recruitment tips and tricks.